In July 1936 the M.B.150.01 prototype failed even to take-off. Redesign, abandoned for a period, was subsequently re-started and a first flight was successfully completed on 29 September 1937. The prototype had been revised with a larger wing and a 701-kW (940-hp) Gnome-Phone l4No radial. Trials confirmed that the revised prototype was a promising fighter, and span and power were again increased. Bloch had become part of a nationalised group by this time, and from this SNCASO was ordered the M.B.151 in the form of 140 aircraft including 25 pre-production machines. The airframe was redesigned for mass-production, and the first aeroplane flew on 18 August 1938 with the 14N-11 engine. While testing and further production were taking place, the improved MB-152.01 with a 14N-25 engine, in place of the MB-151's less powerful 14N-35, was tested. The imminence of war led to additional orders, based on optimistic MB-152 performance figures (reached with inaccurate measuring instruments). The first MB-151 delivered was not accepted by the Armee de l'Air until March 1939, and was regarded as unsuitable for combat. Even after modifications, Armee de l'Air MB-151 were utilised only for training. The designers had also been working on an improved version, the M.B.152 with more power and revised armament. 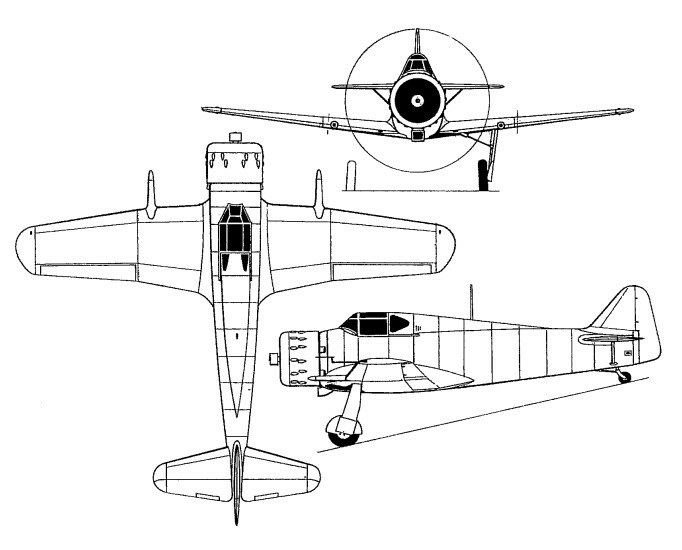 The Bloch 152 C1 cantilever low-wing monoplane was one of the standard Armee de l'Air fighters during the Battle of France in May-June 1940, but was comparatively unsuccessful. The 745.2kWGnome-Rhone 14N-25 radial engine powering most Bloch 152 was insufficiently powerful to give good performance; a number had the improved 14N-49 engine and Chauviere 371 variable-pitch propeller, which rendered them more effective. It was clear, however, that the Bloch fighters (while robustly built and stable in flight) lacked manoeuvrability. Nevertheless Bloch-equipped units were credited with 146 confirmed and 34 probable victories by the time of the June 1940 Armistice. The first fighter Groupe to equip with the MB-152 was GC I/1 at Etampes-Mondesir in July 1939. The type was subsequently withdrawn for modification and when war broke out no Bloch fighters were in escadrille service. Re-equipment got under way at the end of 1939 and by the time of the German Blitzkrieg on 10 May 1940, 140 MB-151 and 363 MB-152 had been taken on charge by the French. Some of the former were to see service with navy fighter escadrilles. By the time of the Armistice the number of MB-152 accepted had risen to 482, plus one MB-153 (with Pratt & Whitney Twin Wasp radial) and nine MB-155. Nineteen more MB-155 were completed by the Vichy French. They differed from the MB-152 in detail and had increased fuel capacity. Externally the main change was in the adoption of a smooth engine cowling. The Vichy regime was allowed to retain six (out of nine) MB-152-equipped Groupes after June 1940, but only 215 MB-152 and MB-155 were on charge when the air arm was dissolved by the Germans in November 1942. Twenty MB-152 were sent to Romania and others (plus some MB-155) ended their careers as Luftwaffe trainers. Nine MB-151 of a Greek export order were delivered to that country in 1940, but there is no record of their operational use. Production totalled 483, but most of these were inoperative in France during1940 for lack of propellers. Engine: l x Gnome-Rhone 14N-25 or N-49, 805 or 820kW (1,080 or 1,100 hp). Span: 10.55m (34ft 7.25 in). Length: 9.1 m (29ft 10.25 in). Max T/O weight: 2680 kg (5,908 lb). Max speed: 320 mph at 13,125ft. Armament: 2x20-mm Hispano-Suiza cannon and 2x or 4x7.5-mm (0.295-in) MAC machine-guns.